• According to TheWrap, Jon Hamm is joining Jon Stewart on Comedy Central’s Night of Too Many Stars, an event that raises funds for autism awareness. • Christina Hendricks, along with Keanu Reeves, has been cast in Nicolas Winding Refn’s The Neon Demon, according to Variety. • Matthew Weiner, speaking along with other members of the 65th Berlinale’s main competition jury, jokes that his presence has “clearly lowered the status” of the festival, according to The Hollywood Reporter. • In a new TV commercial, featured by Digital Spy, Jon Hamm explains Red Nose Day, a U.K. telethon that’s coming to the U.S. for the first time in May. • Meanwhile, the North American rights to Sleeping With Other People, a romantic comedy starring Alison Brie, have been purchased by IFC Films, Variety says. • Talia Balsam has been tapped to co-star in Divorce, a new HBO comedy headlined by Sarah Jessica Parker, according to The Hollywood Reporter. • John Slattery is featured in the new poster for Bluebird, a movie directed by Lance Edmands that will be released on Feb. 27, Indiewire reports. • TheaterMania reports that Elisabeth Moss and other cast members of the upcoming Broadway revival of The Heidi Chronicles will participate in a discussion at New York City’s 92nd Street Y on Mar. 29. 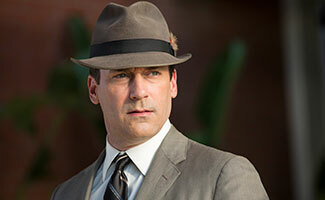 To stay up-to-date with all the latest Mad Men news, sign up for the Mad Men Social Club.